EX TC Owen May Not Be Done Yet! 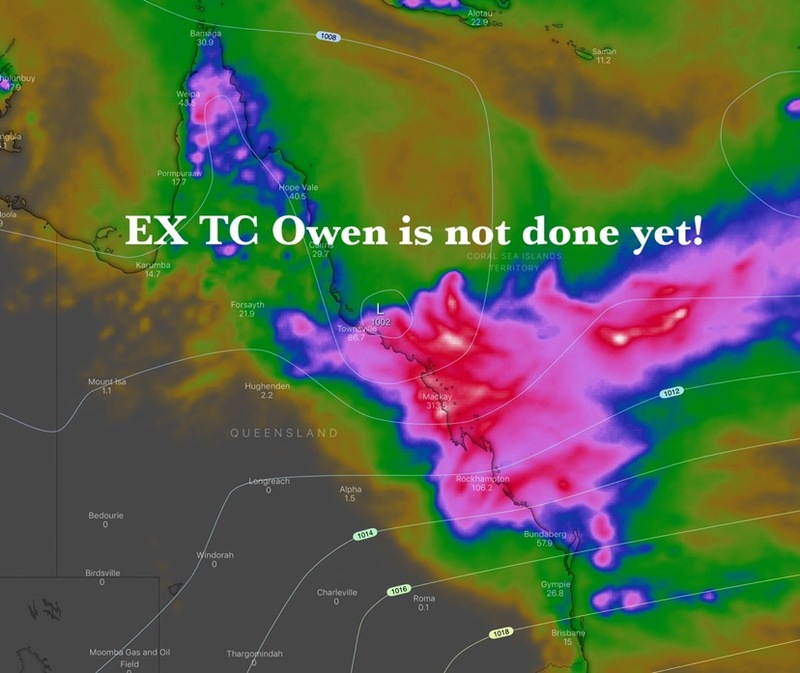 Home/Forecast/EX TC Owen May Not Be Done Yet! Issued 5th December 2018. EX TC Owen is currently located in the Coral Sea 700kms North East of Mackay. Currently it is a low level circulation but it could intensify again and hit the Central and North QLD Coasts later this week. It this were to be the case, areas from Mackay to Townsville could see very heavy rainfall and very strong winds. This area could also be extended to include as far South as Rockhampton and North to Cairns based of various model data. Above image: Next 5 day rainfall forecast totals, pink = Heavy rainfall over 100mm up to 300mm via Windy.com Below image: Current satellite image with EX TC Owen circled in red, future forecast track arrows and a trough marked in green with future track arrows. During Wednesday, Thursday and Friday a large high pressure system to the South will cradle the low towards the West while increasing South Easterly winds along the QLD coast. These winds are expected to trigger showers and some storms through Central East and North East districts on these days. On Saturday the low is forecast to intensify further into a deep tropical low (one model has category 1 cyclone) while nearing the Central to North QLD coast between about Mackay and Townsville. A very tight pressure squeeze is expected between the low and the high down south which would significantly increase winds along the coast. These winds may actually reach damaging strengths of between 90 and 110km hr across the Whitsunday Islands. Showers and rain areas with moderate to heavy falls could also increase depending on how close the low and a trough is to the coast. Sunday at this stage is the day to watch! A number of global models suggest EC TC Owen will intensify to be either a strong tropical low or possibly even a category 1 cyclone. 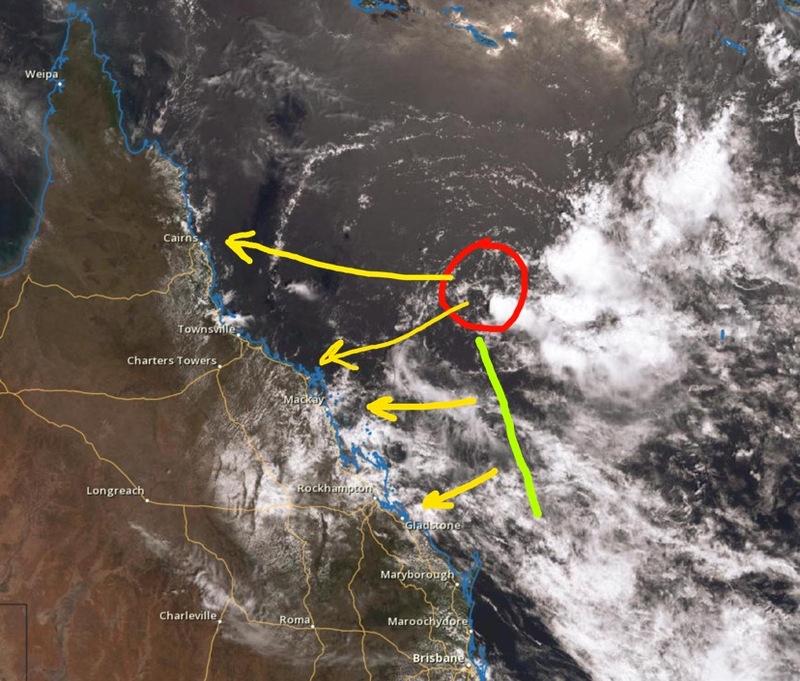 The system is expected by all data to continue to track west and CROSS the coast somewhere between the Whitsundays and Cairns. So given this scenario on Sunday rain areas with moderate to heavy falls are forecast along the Central and North Tropical QLD coasts. Very strong to damaging winds are also forecast near to where the low is located. Current maximum 5 day rainfall forecast totals from Wednesday to Sunday include: Townsville 100mm, Bowen 160mm, Mackay 300mm these are more likely to occur at this stage with high rainfall extending inland up to 100kms. Rockhampton 100mm and Gladstone 150mm are just possible. Please stay tuned for further updates as this is a very dynamic weather pattern and system which deserves attention and respect.